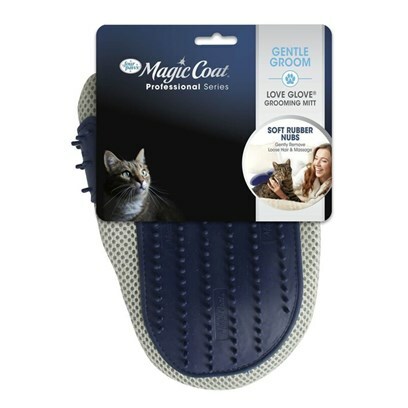 Like the original Love Glove, the Love Glove for Cats removes dead hair as you gently massage and pet your cat. Now removing unwanted hair (and helping your kitty avoid hairballs) is an easy and relaxing experience. The glove fits any hand and stays on thanks to a Velcro strap. Don't worry about clean-up. The hair peels off the rubber tips with no muss or fuss. Secure the glove on your hand with the adjustable strap and gently stroke your cat's coat. The hair will cling to the rubber. Hair can easily be peeled off or rinsed away with cold water.